In The Mystery to a Solution, John Irwin brilliantly examines the deeper significance of the analytical detective genre which Poe created and the meaning of Borges' efforts to "double" the genre's origins one hundred years later. Combining history, literary history, and practical and speculative criticism, Irwin pursues the issues underlying the detective story into areas as various as the history of mathematics, classical mythology, the double-mirror structure of self-consciousness, the anthropology of Evans and Frazer, the structure of chess, the mind-body problem, the etymology of the word labyrinth, and dozens of other topics. Irwin mirrors the aesthetic impact of the genre by creating in his study the dynamics of a detective storyâthe uncovering of mysteries, the accumulation of evidence, the tracing of clues, and the final solution that ties it all together. 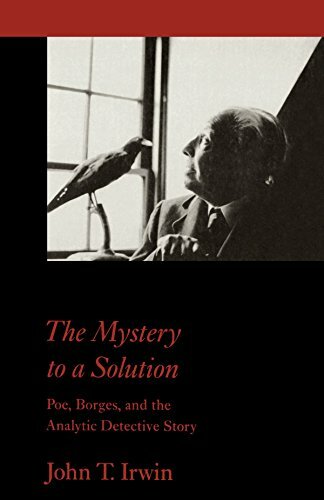 About: In The Mystery to a Solution, John Irwin brilliantly examines the deeper significance of the analytical detective genre which Poe created and the meaning of Borges' efforts to "double" the genre's origins one hundred years later.